This is a 3-in-1 reference book. It gives a complete medical dictionary covering hundreds of terms and expressions relating to shoulder pain. It also gives extensive lists of bibliographic citations. Finally, it provides information to users on how to update their knowledge using various Internet resources. The book is designed for physicians, medical students preparing for Board examinations, medical researchers, and patients who want to become familiar with research dedicated to shoulder pain. If your time is valuable, this book is for you. First, you will not waste time searching the Internet while missing a lot of relevant information. Second, the book also saves you time indexing and defining entries. Finally, you will not waste time and money printing hundreds of web pages. 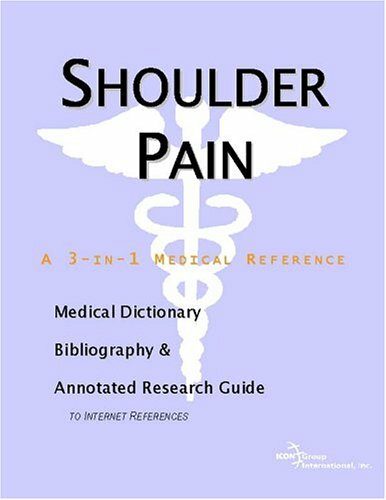 In addition to offering a structured and comprehensive bibliography, this medical reference on shoulder pain will quickly direct you to resources and reliable information on the Internet, from the essentials to the most advanced areas of research. Public, academic, government, and peer-reviewed research studies are emphasized. Various abstracts are reproduced to give you some of the latest official information available to date. Abundant guidance is given on how to obtain free-of-charge primary research results via the Internet. E-book and electronic versions of this book are fully interactive with the Internet. For readers unfamiliar with the Internet, detailed instructions are offered on how to access electronic resources. For readers unfamiliar with medical terminology, a comprehensive glossary is provided. For readers without access to Internet resources, a directory of medical libraries, that have or can locate references cited here, is given. We hope these resources will prove useful to the widest possible audience seeking information on shoulder pain.